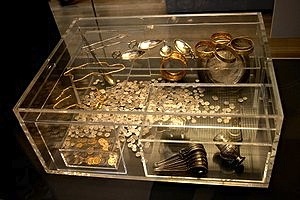 The Hoxne Hoard had been preserved for 1,600 years. 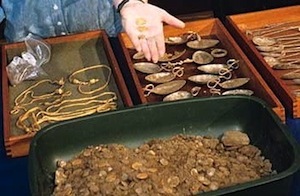 The hoard of Roman coins and other items was discovered by Eric Lawes with his metal detector on November 16, 1992 in a field near the village of Hoxne, England. Lawes’ friend Peter Whatling, who was a tenant farmer in that field, had lost his hammer and asked Lawes to try to find it. The detector hit on silver spoons, gold jewelry and gold and silver coins. 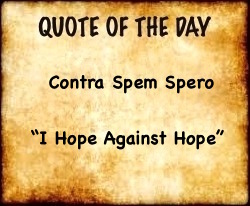 They did the right thing and immediately notified the police. 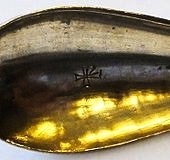 Archaeologists did an excavation of the site and found the entire Hoxne Hoard in one day. It is mainly made up of gold and silver coins and jewelry valued at c. 5 million US dollars. 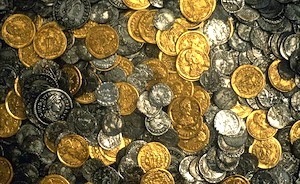 The Hoard can be dated to the late 300-400’s AD in Britain because the coins were minted from the Constantinian dynasty to the Theodosian dynasty (c. 312 to c. 400’s). 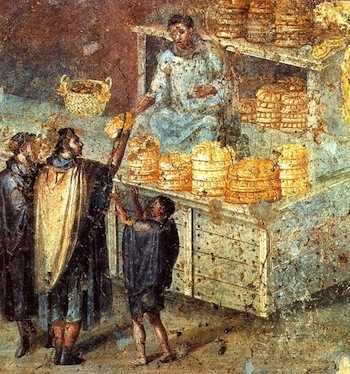 It is a good surmise that the Hoard was buried in the box and caskets by a wealthy Christian family (there were several Christian names, symbols like the Chi-Rho and phrases on the spoons and jewelry) in the early 400‘s when Rome and her armies were pulling out of Britain. The vacuum Rome left was soon filled by a migration and invasion of the German Saxons, Angles and Jutes. 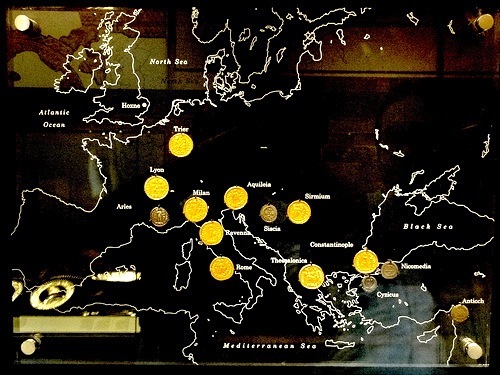 Path of early Christian Romans into Western Europe and places where these coins were minted. 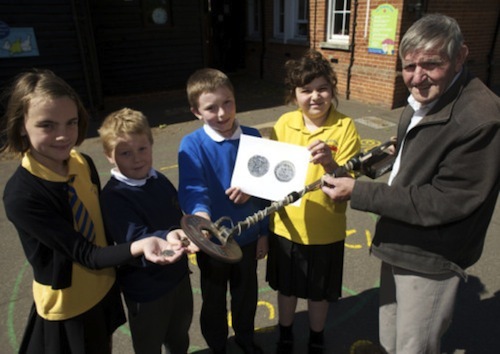 Hoxne, Suffolk—Eric Lawes who found the Hoxne Hoard shows some children at St Edmunds Primary School how he found it with a metal detector.